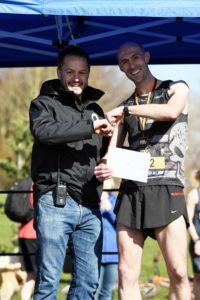 To build the appetite for the masterpiece that will be the 2017 London marathon review (hence the importance of putting years in the title), a quick summary of the Rushcliffe 10k 2018. On a warm morning, there was sun for the first time this year (still 2018 we are talking about) around the race village (3 tents). Having decided to sign up with a coach since the last 2 years (see forthcoming London 2017 race report) have established that inept coaching (i.e. self coaching) leads to injuries, I did the prescribed 3 mile warmup (never done one that long before! ), and was then ready for the start. I actually felt good at the start line too, not sluggish which is unusual. Pretty sure it is unrelated to the strides etc. I’d done in the previous 25 minutes. The start in theory was ‘pulses’ of runners every 30 seconds, in practice people poured over the line and settled in for 6.3 miles (we’ll come to that) of running. 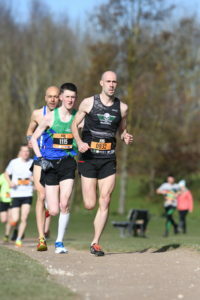 The photo below of the start also captures the decisive break of the race where Simon Birch of Hinckley running club pulled away from the leading pack with around 10k to go. After the first 40 metres first place was sealed for him, and the masses left to fight over the scraps. The course itself isn’t too bad, though can’t be described as fast. Mostly gravel paths with a few inclines (nothing too mean), the ubiquitous out and back, marshal shouting to mind the hole (why not just put something in it? Or over it? ), and a 135 degree bend. All on a 2 lapper. A bit further in to the race (100m) and it seems I had second place in the bag (Simon now out of sight). What was good are the photos, which rather than being an arm and a leg, and another arm, were free to download and actually good photos – I even had my eyes open on some (The photographer was Marc Dewhurst). 50 metres further and 3rd place was sorted for Marlon Dunkley (seen above in 4th). After that it was hard solo efforts for all involved. 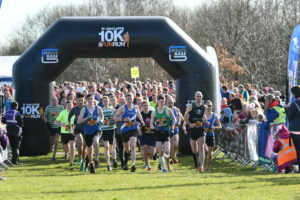 It became particularly tricky on the second lap from about 8k as the back markers started to appear thick and fast (often 2/3 abreast) – twice as many people did >1:10 than did <40. Despite this I received encouraging words from the 8k marshal who told me I could catch the leader as he was only about a minute ahead. After weaving through I put on my best sprint finish but was narrowly beaten in to second place by a mere 64 seconds. I didn’t actually see the leader after around 4k. Now for the last few sessions of the spring season, and London 2018. Plus also a London 2017 blog. Maybe. 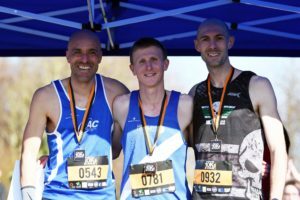 April 4, 2018 in Race Report & Previews.